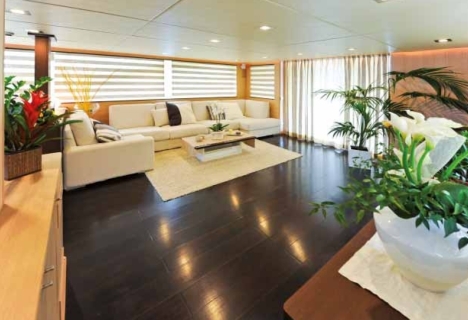 A displacing steel yacht designed as a five star hotel but built for work. Charter or strictly private use? Totally personalised custom fittings will tip the scales in either direction. Only a few companies in the boating business may consider themselves as being quite as marketing oriented as Mauro Corvisieri's C.Boat. 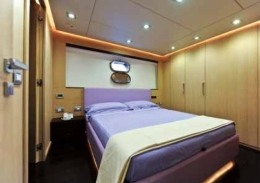 After ten years at the helm of one of the most popular charter companies, boasting a fleet of over 25 yachts and 7 aeroplanes, the young manager from Palermo has decided to build a line of large cabin yachts conceived and designed to satisfy the specific requirements of his wealthy customers. For further information: C.Boat, via Ammiraglio Rizzo, 17; 90142 Palermo (PA), Italy; phone +39-091-6372604; website www.cboat.it; e-mail info@cboat.it. They tend to be professional people who have little to do with the sea and whose main requests only boil down to two things: to feel perfectly comfortable and protected by a type of 'vehicle' they really don't know much about and to be able to do so in the comfort and surroundings of the five star hotels they are accustomed to. Corvisieri's answer is indeed before us: the C-Boat 27 82 is to be the first unit out of the new yard that is to set the conceptual design upon which the whole line is to be developed, represented by four different models reaching lengths of up to 35 metres. As far as safety is concerned the 27 82 appears to enhance all those technical specifications that would belie an accent on "work boat". A quick glance at the building specs. makes it quite clear that it is not just a question of 'labels', after all, the 8 millimetre steel thickness of the hull and the 50 centimetre intervals of the main structure's ribbing should be proof enough. 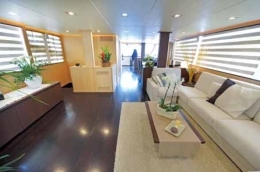 In as far as the living spaces are concerned, it really should suffice to take a stroll through the areas to notice that there are very few, if not none at all, of those 'discomforts' usually attributed to yachting, that, even on some superyachts, may cause one to wish for the plush feel of home. 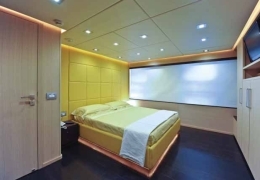 Hence the cabins, and not only the owner's master stateroom with its 25 square metres, all resemble 'real' bedrooms for both shape and size. The passage way serving them, certainly appears as a complete waste of space to the trained eye. However, if the areas below most radically distinguish themselves from those of its peers, the main deck is not altogether lacking points of interest. Here, the same idea of geometrical design seen on the lower level, is greatly enriched by streaming light which enhances the minimalist décor and rather emphasizes the existing chromatic differences of the 'essences' used. Thanks to this, the black wooden flooring becomes the real protagonist of the large saloon where we would like to imagine, perhaps because of the vague hint of eastern landsacapes, simple but outstanding Ikebana compositions prepared by expert hands. 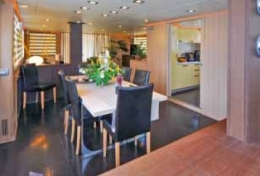 The dining area slightly beyond amidships, corresponds precisely with the galley: undoubtedly an area of professional imprinting but elegant enough to merit sight through twin sliding doors. The bridge, located all the way forward, is made to look quite spectacular thanks to the sloping window panels which, aside from providing excellent visibility to the three sides, provide it with special natural light. It is important to stress that such original fitting out is no more than an idea, a suggestion, a possibility: indeed any non structural body is to be considered modifiable or even entirely re-designable. Even the Fly bridge is open to alternatives, in our view, it should remain exactly as it is, especially in the forward area hosting the helm/control station. 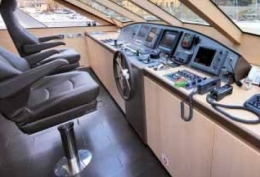 We particularly appreciated the fact that despite a spacious dinette being set forward of the pilot station, vision of the bow is not all impeded. In our opinion there is great coherence between what we saw moored up and what we experienced under way. A comfortable and somewhat lulling displacing progress, in the sort of silence that ensures that conviviality on board may begin on departure rather than necessarily on arrival. Hence those 10-11 knots of cruising speed provided by the rather economical engines (two Caterpillars each of 875 HP), loose any attribute of slowness and gain that of acquired pleasurable calm. Slow-cruise, a bit like Slow-food, if you will.